Chill and Heal Cryotherapy Spa is THE local expert for Shreveport Cryotherapy. Our certified staff will make your session amazing and your visit memorable. Come visit the #1 Ranked Shreveport Cryotherapy Spa located in Ashley Ridge. Why should you come and see us versus the other guys? The list is long and informative! We are happy to say that we offer staff that is certified and trained by the best cryotherapy experts in the nation. Not only that, but Chill + Heal Cryotherapy Spa in Shreveport also offers the BEST cryotherapy machine on the market. What to expect at your Cryotherapy visit? Our staff will make sure that you are well informed and comfortable before your session begins. We will personally walk you through all of the scientific mechanisms of cryotherapy and tell you exactly how your body will respond. Not only that, but we are here to answer any and all of your questions before your session begins. It’s one of the things that makes Chill + Heal the #1 ranked Cryotherapy Spa in our area. We make sure our clients are comfortable and ready before they begin their first session. Chill + Heal also offers all of the items you will need while you are experiencing your first cryotherapy session. What should I expect from a Cryotherapy session? You should expect to feel amazing! Most clients talk of a euphoric and amazing feeling after they exit the cryotherapy chamber. 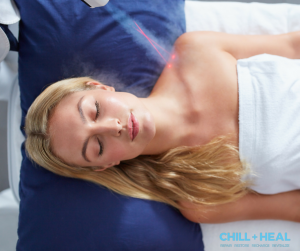 Our experts here at Chill + Heal Spa will make sure to monitor your skin temperature and help you target the the best experience possible. Our number one priority is to make you feel better than you did before you walked in the door. What else can you find at Chill + Heal Spa? If you are looking for an amazing cryotherapy experience, head over to Chill + Heal Spa where your local Shreveport Cryotherapy experts will take amazing care of you. Have more questions? You can find answers on our frequently answered questions page. You can also click here to find more in depth information about the treatments we offer. And lastly, click here to fill out your waiver and make your appointment!